Windows are a favorite with vandals and thieves. They let wrongdoers survey your valuables. They also provide easy and fast access to your property. It takes minutes, maybe only seconds, for someone to smash your windows and get inside your business. Once inside, vandals and thieves make quick work, grabbing and going, or smashing and dashing. Portland has seen its share of violent street protests in the past. Recently there’s been an uptick of energetic crowds marching through downtown. Many protesters were peaceful. Some were destructive. Others weren’t protestors but opportunists working under the cover of the confusion in the streets. Security film strengthens windows against random vandalism. It can give you greater peace of mind during times of unrest. Window film also protects against burglars breaking in through your building’s most vulnerable points. Windows pose a larger risk than you might think. The pane or two of glass that separates you from the outdoors is no match for a burglar, and it certainly wouldn’t stand up to a bomb blast. What’s worse is that when natural disasters and bombings occur, the majority of resulting personal injuries are actually caused by broken windows and flying shards of glass. That’s where safety and security film comes in. A thin film applied to the glass can protect your home and your family by preventing burglars from entering. The film keeps your business safer. Whether at home or work, film can keep a window from breaking. If the window does shatter, the film holds the pieces of glass together. The glass won’t go flying. It stays put where it won’t cause harm or mess. Solar Gard’s Armorcoat brand of safety film comes in thicknesses ranging from 4mm to 14mm. Each thickness is tested with regard to government and industry standards against human contact, intrusions, bombings, fire, and natural disasters. This test is performed to determine the material’s ability to reduce or minimize cutting or piercing injuries when the glass is broken by human contact. Film-backed transparent glass is clamped into place and a leather bag containing more than 100lbs of lead shots is dropped onto the film side of the glass. Researchers begin dropping the bag from as little as 11 inches and increase the distance to as much as 2 1/2 feet. 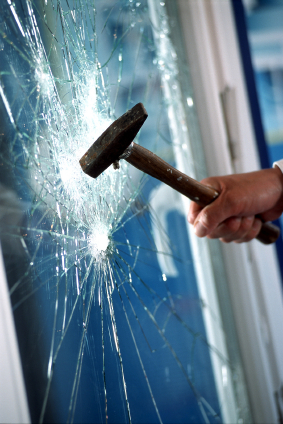 Through each round of testing, the safety film was never damaged enough to expose broken glass. The results showed that Armorcoat films perform at the highest level and pass the requirements for Grade A Safety glass and glazing materials. The 14mm Armorcoat film is tested for burglary resistance by subjecting it to various amounts of force, using objects ranging from small hand tools to full-sized power tools. After multiple blows with each object, the film proved to resist most levels of forced entry and met or exceeded industry standards. This round of testing evaluates the response of the window and the film to air blasts caused by bombs (500 lbs of TNT) detonated at various proximities. The product’s performance is based on its ability to reduce the likelihood of injuries caused by flying broken glass. Armorcoat films at 4mm, 7mm, 8mm and 14mm thicknesses met the U.S. General Services Administration (GSA) Performance Criteria for Level C Buildings, as well as standards established by the American Society for Testing and Materials (ASTM) and the International Organization for Standardisation (IOS). The purpose of this test is to determine whether the glazing system would fuel a fire. Researchers looked to see if the window and film would ignite when exposed to heat, spread the flame, or react negatively to smoke, toxic gases or flaming debris. The Armorcoat safety and security films were placed in a furnace for testing and proved to be a safe building material that would not contribute to a fire. Results of the test showed a Flame Spread Index of 15 (on a scale of 0-200) and Smoke Developed Index of 20 (on a scale of 0-450), giving it a Class A rating according to ASTM and the national fire protection association. Armorcoat safety films were tested against the impact from small and large projectiles followed by air pressure variations to simulate high winds during severe weather. The performance of the entire glazing system is evaluated based on its ability to protect against damage and water intrusion. (A glazing system includes the film, window frame, attachment system and seals). After many rounds of testing, which included shooting a 2×4 from a cannon at the window (talk about a projectile), the Armorcoat films never allowed a projectile to penetrate the glass. The window film did not tear or delaminate. While the windows did break, the film kept the glass in place and upheld standards for water resistance– even under severe air pressure changes. Interested in fortifying your home or office with Armorcoat safety and security film? Contact Pacific Window Tinting today. Call (503) 736-9000 or send us an email and we’ll get in touch with you shortly! Updated Feb. 14, 2017. Originally published April 14, 2014.